What is happening with the Travel Advisory? More than one year ago, the State Dept. 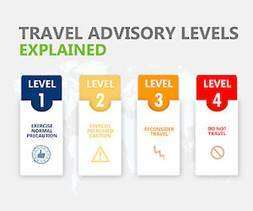 revised its travel categories and expanded from 2 levels historically used and created a revised 4 level advisory procedure, which allows for more nuances Here is an overview of the newer 4-tier level of advisories : New Travel Levels and includes a full listing of 52 other countries that currently have a Level 2 categorization. Of course, it is always a good idea to purchase travel insurance; we recommend Travelex . The most beneficial plan is to include the “Cancel for Any Reason” pak as an option, as this provides the most flexibility in any situation. Following a Dec. 2018 indictment and arrest of the CFO of Huawei, the tech giant in China, there has been a change in US/China diplomatic relations (Time Inc. refers to “ diplomatic spat” read more...). Currently the Huawei CFO faces a 10-count grand jury indictment for selling restricted technology to Iran and lying to US banks on the sales, as well as a separate 13 count indictment for stealing proprietary intellectual property from T-Mobile. US law enforcement authorities requested Canada to detain this executive’s return to China while traveling on a return route through Canada. 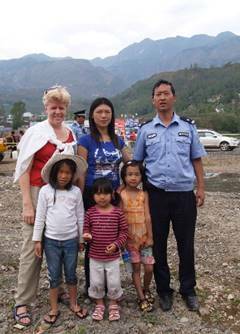 China retaliated with detaining a Canadian ex-diplomat and governmental advisor. China also detained three immediate family members of a former executive at a state-owned bank and who is accused of participating in a 1.4 billion fraud case. On Jan. 3, the US State Dept. issued a Level 2 Travel Advisory, warning to exercise increased caution. What to keep in mind while I travel in China? We always recommend to avoid critical statements on government policies, politics or religious topics in a public conversation. Also, if you communicate via social media or email while in China, it’s always a good idea to avoid such topics and statements that might be critical of the Chinese government. Any such conversation would make a Chinese citizen uncomfortable, as there are governmental ideological differences. It is best to travel with an established, knowledgeable agency that has a tour guide stay at the same hotel in each location throughout your journey. By having Lotus arrange the travel, we have a local guide and travel organization in each province, so we can respond quickly to any situation. If something unexpected EVER occurs, whether there is a Level 1 (Normal precautions) or a Level 2 (Increased Caution) should take place, the tour guide will contact us and we will work local staff to assist.